Learn how to create a beautiful illustration of a horse and then see a few alternatives when it comes to adding colors and patterns. Horses are not so easy to illustrate. These gorgeous animals have a few body parts that can be hard to draw for beginners. In this lesson, I will show you how to create those parts easily using simple lines and basic shapes. 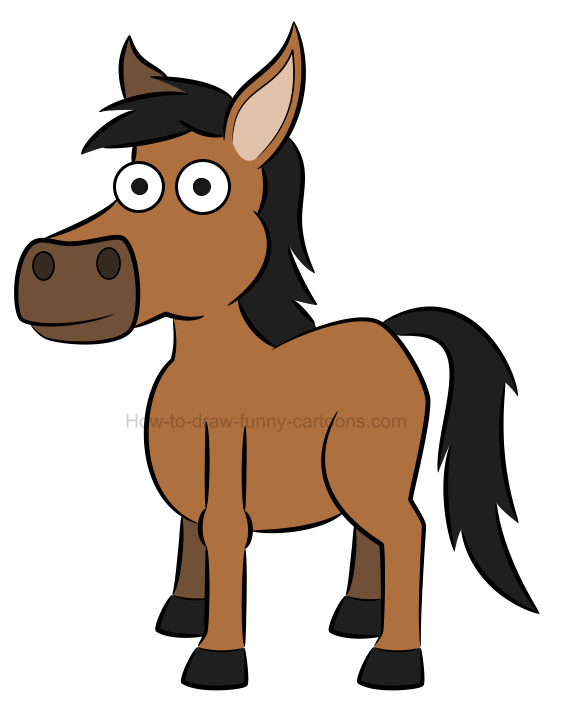 To make the whole process even easier, let's take a few minutes to study this cartoon animal carefully. you can use the illustration above while going through the list found below. Ears are made from curved lines and are pointed near the end. A large patch can also be drawn inside the left ear. Eyes and pupils are done using small circular shapes. The jaw is made from long curved lines. The back of the horse is strong and drawn using broken lines. The tail is long and hairy. The back leg is the most difficult part to draw. Study this shape carefully. 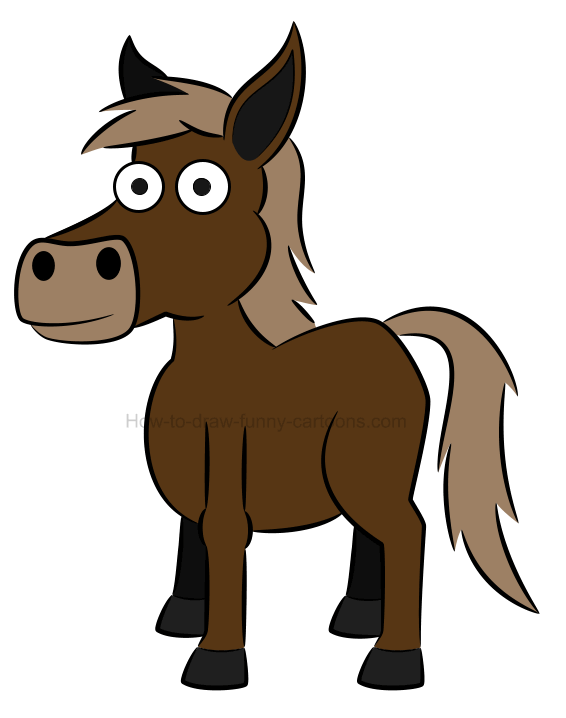 Hooves are made from small rectangles. The front legs are thinner and longer. You can use a long curved line to represent the body. The jaw is darker and round on top. The mouth is done using a simple curved line. 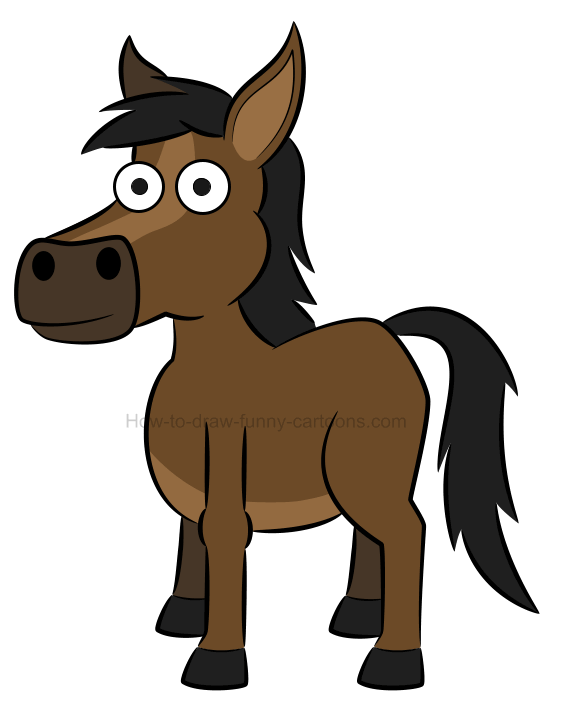 Small circles are used for the nose of the cartoon horse. Don't forget to draw a crest on top of the head. Good! 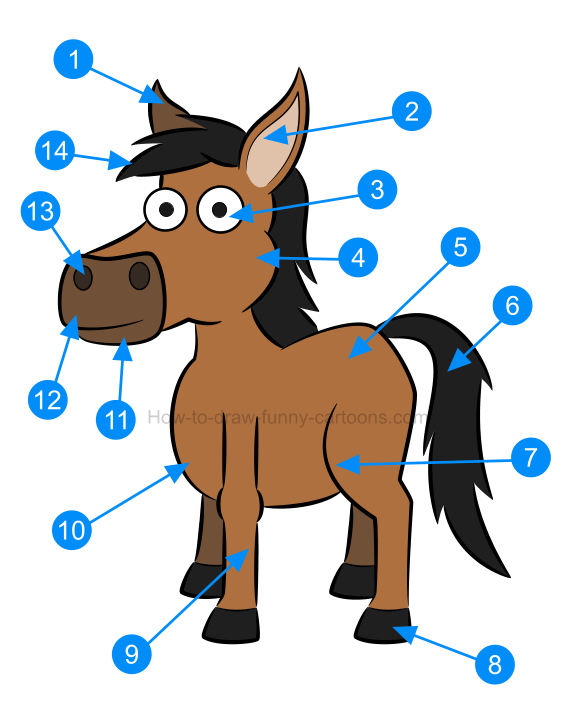 This list should help you figure out how to work on this illustration of a horse properly. Let's begin this tutorial by sketching a few basic shapes to help us illustrate the character. 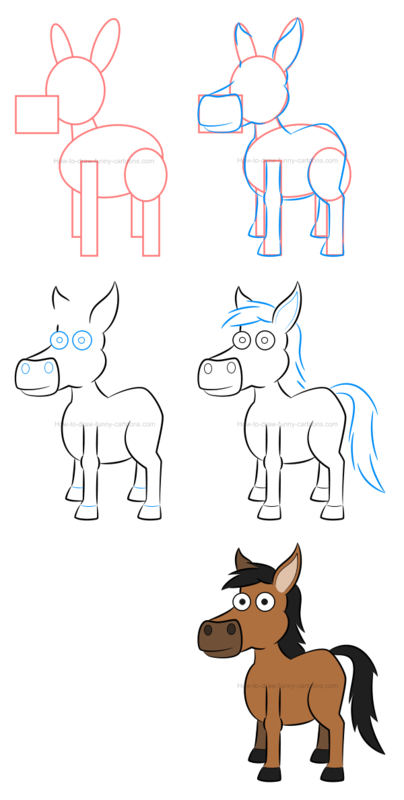 It's a good practice to create a template like the one found below when working on cartoon characters. In this stage, our goal is to sketch accurate proportions. You can start by adding a circle to form the head. 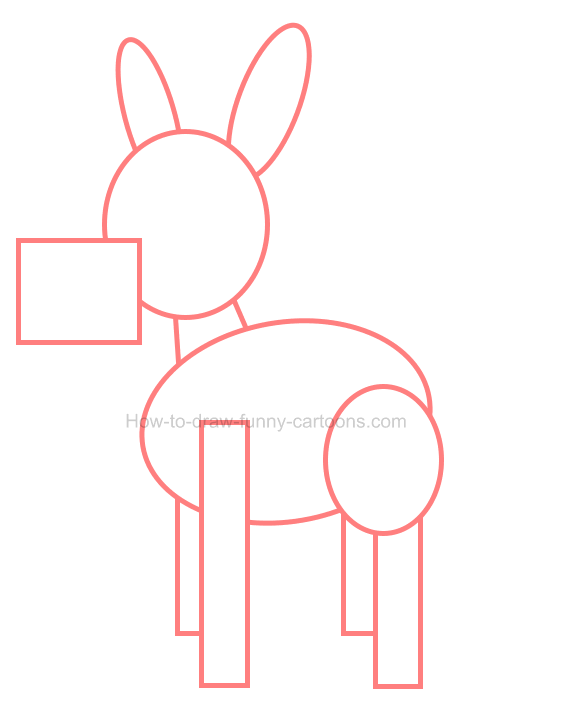 The ears are done using long oval shapes and the jaw is created with a square. The body is made from a large oval shape and legs from rectangles. 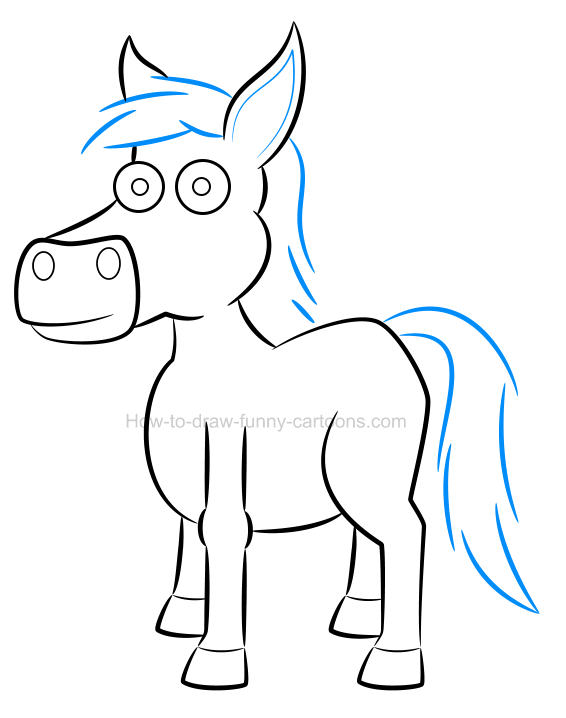 It's time to draw our little cartoon horse. Like we have seen in the first part of this lesson, pay attention to areas like the ears, the back legs, the jaw, the body and the hooves of the animal. If these elements are drawn properly, then chances are that the final result will be visually appealing and accurate. Inside the head, draw two large circular shapes to represent the eyes. Both pupils are made from smaller circles. You can also draw perfect oval shapes inside the jaw to create the nose. 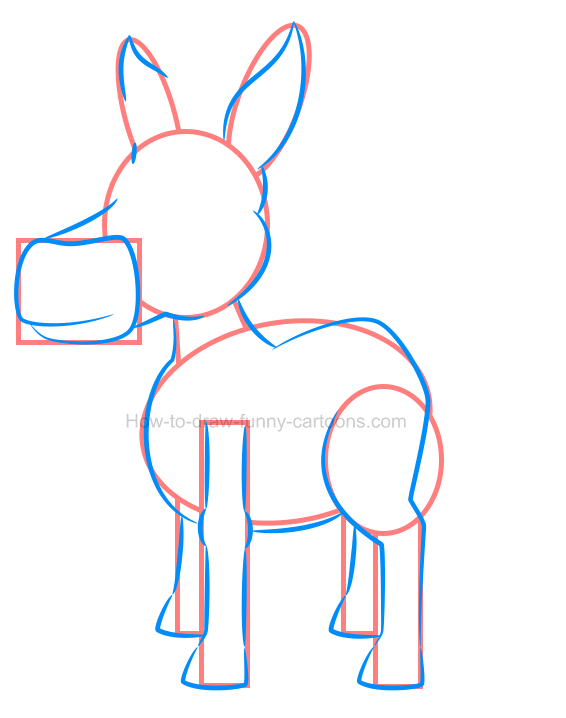 Finally, complete this third step by sketching small line between the legs and the hooves. Cool! This illustration of a horse is almost finished! Inside the left ear, draw a large patch using two long curved lines. You can also draw the crest using more short lines. Near the back of the character, draw the tail using the same technique used for the crest. This illustration of a horse is now completed. Let's add some colors! 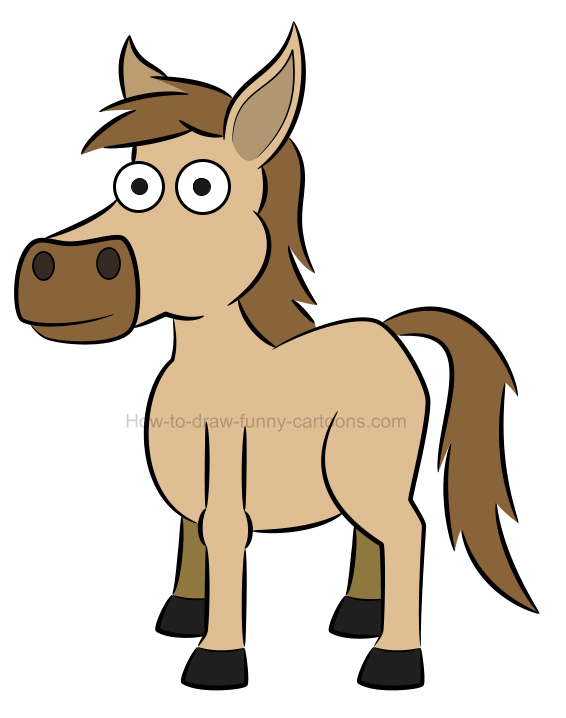 For this version of the cartoon horse, a nice brown color was added to the body. The patch inside the ear can be filled with a lighter version of the same color. 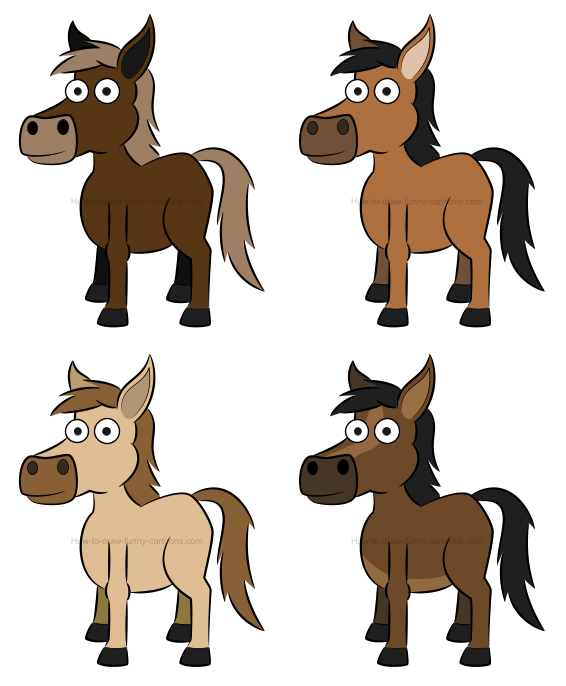 Legs that are found behind the horse, the jaw and the right ear can all be filled with a dark brown color. The crest and the tail are black. 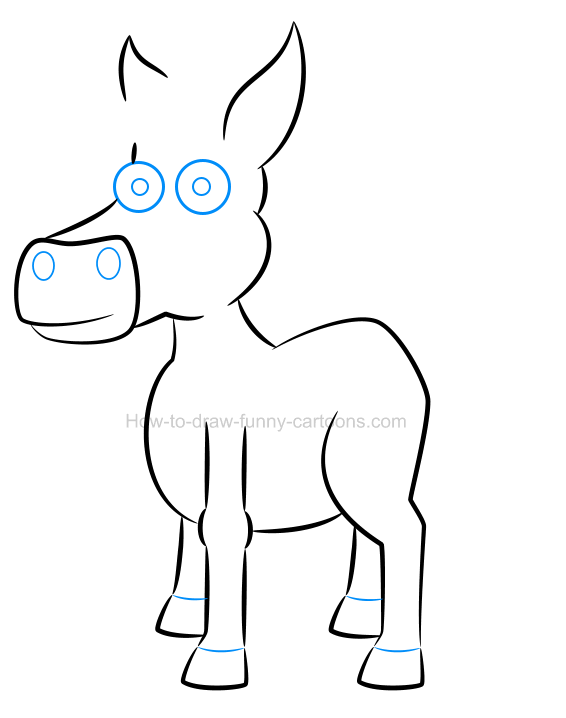 Below you can see all five steps needed to draw a beautiful horse quickly and easily. The patterns and colors selected for this version of the animal were pretty basic so it might be fun to try a few alternatives and see how it goes ... ready? Go! In this first attempt, the skin of the horse is filled with a very bright brown color. The tail, the jaw and the crest are brown. I really like this version. The character is easier to read and although colors might not be quite realistic, the character is appealing and interesting. For this second character, most colors are now darker and more saturated. The crest, the tail and the jaw are almost black while the body is filled with a very dark brown color. New patterns were added on the forehead and on the stomach of the character. This illustration of a horse might be slightly harder to read, but it's still quite effective. Let's go back to the original character (the one without patterns on the stomach and near the forehead). In this last attempt, the skin is dark, but areas like the tail, the crest and the jaw are now filled with brighter colors. The contrast is quite interesting and this version is also appealing and easy to read. Have fun and just try new things!